“There was a time in this fair land when the railroad did not run...” wrote Gordon Lightfoot in his iconic Canadian Railroad Trilogy. But it seems ever since the iron road stretched from sea to sea, it has engendered a love-hate relationship with the wood products manufacturing industries that use its services. It is no longer just delivering products to Lightfoot’s “young growing land” but to markets increasingly offshore, diverse and competitive. In many parts of the country, the national railways enjoy a monopolistic advantage. CN, for example, has such a situation in Canada’s largest softwood lumber producing region of central and northern British Columbia. One frustrated shipper confided his recipe for getting and maintaining the railway’s attention for his lumber shipments: become a partner with a First Nations group. That advice is simultaneously racist, cynical—and true. The Forest Products Association of Canada (FPAC) is optimistic a change may finally be in the offing through a more conventional manner. The reason is the Fair Rail Freight Services Act the federal government recently introduced in Parliament. 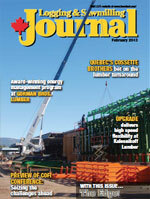 It’s no panacea for all the lumber and other shippers’ complaints and concerns. But it is seen as a means to level the playing field. The key word is the first one in the proposed Act’s name: fair. “This legislation by itself does not provide quality rail service,” conceded David Lindsay, president and CEO of FPAC. “However the power to hold the railway companies to a basic level of service will balance the business relationship and allow for fair business negotiation,” he asserted. The next step is to try and move the bill as expeditiously as possible through the House of Commons.”Fast tracking the bill will be a good way to help forestry companies and other shippers move towards a balance between themselves and the railway monopolies,” continued Lindsay. The railway companies, on the other hand, are unlikely to share that view. If the bill is stalled/shunted onto a procedural siding for whatever reasons, it will not disappoint the railways too much. The problem in many parts of Canada is rail transportation is the only feasible way to get natural resource products to the market and end customer. It is especially vital to the small and rural communities in the hinterlands. For years, locating a sawmill for example, on or close to a rail spur has been a major logistical consideration. The effects of delays are cumulative, reverberating domino-like down the supply chain. If lumber is late leaving the mill loading deck in central B.C. for instance, it runs the risk of arriving late in the Port of Prince Rupert. That can easily translate into missing the next ship leaving for China. The effects continue and can become further magnified by the time the lumber reaches its Asian customer. Too many delays will fray the most understanding of trade relationships given the reality of today’s highly competitive lumber markets. All that because a train did not show up on time at some rural siding in B.C. Now that’s an all too familiar feeling for many Canadian lumber shippers. The frustrations can be many, not just the train arriving late as in the above example. Sometimes the rail cars may be available and on site in time but there aren’t enough of them. Or the rail cars might be damaged or broken. Talk to anyone preoccupied with the timely shipment of lumber—they’re the ones wearing a worried expression—and they can deliver their own litany of woes. “The (proposed) legislation will help ensure a fair and balanced relationship between shippers and the railways by giving our forestry companies and other rail customers the right to service agreements and dispute settlement mechanisms along with significant penalties for non-compliance,” summarized Lindsay. Although the FPAC gives the proposed legislation a passing grade, concerns remain that are either not addressed or not adequately addressed in the association’s view. One such issue is having existing confidential contracts between shipper and railway uncovered by the new legislation proposals. What happens next in Ottawa will be key. When and how the Fair Rail Freight Services Act is passed into law will indicate whether there really is a new relationship dawning between the country’s wood products sector and the national railways.